Leo and Caleb aren't best friends. Then again, most siblings have complex relationships. When Caleb's angry though, his outbursts literally send Leo running. This violent behavior forces the family to relocate, to a new setting where Leo and Caleb both hope to prosper. Over time, Leo develops the ability to run fast and think ahead. He joins the cross-country and track teams at his new school, and even befriends a state champion. Learning from the best runner his age, Leo improves his skills and even meets a girl he has a crush on. Yet Caleb still hasn't managed to settle down in his new life. Leo's newfound peace won't last long, because Caleb's jealousy will soon start to show in violent beatings and scary behavior. 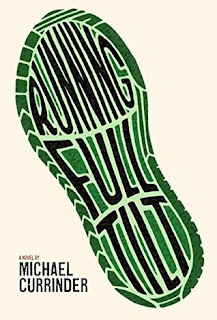 Michael Currinder did an excellent job of replicating fear, nerves, anxiety and success in his debut novel. Conveying emotions to the readers with every sentence, the words made me feel connected to, worried about and happy for Leo. The character development in this novel was great. Almost all the characters were dynamic, which is no doubt a hard thing to achieve. The skills and tricks Leo learned in his training and practices were so clearly applied not only to his races, but also to his general life. He made mistakes often, but was quick to correct them and learn from them. Towards the end of the book, I just couldn't put it down! I'd become so captivated by the characters that I had to see how their stories ended. I was really shocked by how Currinder decided to end the book, but I cannot say that I wasn't expecting something of that sort. I'd recommend this book to any and all Young Adult reader, especially those looking for a book that discusses teenage life without reference to drugs, alcohol or any kind of illegal behavior. It's well-written, realistic and suited for young readers just beginning to read YA books.